A bottle is more than a bottle – it’s also a job creator. That is the underlying message of the “Your Bottle Means Jobs” campaign, which is aiming to help transform the conversation around plastics recycling in one area of the Southeast U.S. In March 2017, the Carolinas Plastics Recycling Council (CPRC), a joint effort between North Carolina and South Carolina organizations, launched the first phase of its two-state multimedia awareness effort. The initial rollout is taking place in the Triangle region of North Carolina, an area that includes Raleigh, Durham and Chapel Hill and is known as a key intersection of business, research, academia and government. The campaign’s economic proposition is straightforward and hard to ignore: If every one of the 6.5 million households in the Carolinas recycled two more bottles a week, roughly 300 jobs would be created in the region. The “Your Bottles Mean Jobs” initiative is an attempt to use engaging modes of marketing to help residents and other entities begin to understand that in addition to environmental benefits, diverting plastic from disposal has huge economic upsides. The relationship between recycling and financial growth is particularly compelling in the Carolinas because many companies that manufacture material from recovered plastics are located in the region, and recycling companies are also important to the economy. All told, Carolina operations engaged in bottle recycling and manufacturing using recycled feedstock employ more than 3,500 people, with capital investment exceeding $310 million, according to research from the South Carolina Department of Commerce and the North Carolina Recycling Business Assistance Center. Companies in North and South Carolina use recycled plastic to make products including pipe, fabric, fiber, carpet and new bottles as well as intermediate flake and pellet products. See the sidebar on page 28 for more details on some of the companies active in the region. However, demand for recycled PET and HDPE bottles greatly exceeds the supply coming out of local programs in the Carolinas. The CPRC estimates that over 6 billion bottles, or roughly 70 percent of total generation, are landfilled each year in the two states. With so much material being lost, local efforts cannot feed the needs of regional companies. One manufacturer, in fact, estimated that all the PET bottles currently collected each year in the Carolinas would represent no more than two days’ supply for his plant. The bulk of the bottle supply for Carolina’s industry instead comes mainly from states with bottle deposit programs as well as from Latin America and Canada. The CPRC, an informal collection of recycling leaders, came together to try to address that issue. Over a two-year period, the CPRC developed “Your Bottle Means Jobs” as the campaign concept and slogan using input from representatives of industry and state and local government. A “Your Bottle Means Jobs” billboard along a commuter route in Clayton, N.C., which is near Raleigh. The first seeds of the campaign were planted on a person-by-person basis. “Your Bottle Means Jobs” allies have appeared at 20 events in North and South Carolina, including golf tournaments, food festivals and environmental fairs. At those outings, staff and volunteers engaged the public and gave out campaign-related swag. They also accepted pledges from residents to recycle and answered questions. Over 1,000 pledges to recycle have been collected to date. The recent launch of the campaign in the Triangle region aims to significantly amplify the conversation. CPRC believes part of what is hampering participation in curbside recycling is the fact that the public does not receive any market signals or encouragement from industry. Job creation is a key issue for Americans everywhere, but the topic is particularly resonant in the Carolinas, where many residents have recently faced unemployment or underemployment. The campaign is spreading the word about the connection between plastic diversion and employment via billboards, radio and online ads. The statement that 300 jobs could be created if each household recycled just two more bottles weekly is based on analysis by the Tellus Institute that concluded 10 jobs could be created along the value chain for each 1,000 tons of bottles recycled. Two bottles a week extra per household would add 30,000 tons to the Carolina plastic recovery infrastructure annually. CPRC purchased billboards at strategic points in the Triangle and has also purchased over 300 10- and 15-second radio spots on a variety of commercial stations slated to run during traffic and weather reports. Keeping up with outreach trends, the campaign will also target 800,000 digital ads in key market segments and areas of low recycling participation. This targeting relies on zip codes identified by area recycling coordinators in various jurisdictions in the Triangle region along with information from the ad agency I Heart Media that has acted as a partner by doubling the number of ads purchased by CPRC. The digital marketing also provides incentives for those who pledge online. Those individuals are entered into drawings for prizes including a beach vacation, gift cards and other goodies, such as PET content shirts and beauty products from Burt’s Bees that are made with recycled bottle content. Use of analytics in the digital component allows the campaign to understand exactly who is interacting with the content. Finally, a 2-minute “Your Bottle Means Jobs” video recently completed with the National Association for PET Container Resources (NAPCOR) will be reformatted to a 30-second format for use in television, movie theaters and other venues. Another video, made in conjunction with the Association of Plastic Recyclers (APR) and featuring HDPE recycling, is pending. The effectiveness of the campaign is being intensified through the engagement of local government recycling education and outreach personnel as well as public information officers from throughout the region. In February, CPRC conducted a training session on the campaign and offered local leaders a toolkit with brochures and posters, items made from recycled bottles, and verbiage that has been used to promote the effort and develop Your Bottle Means Jobs Day proclamations in various jurisdictions alongside Earth Day proclamations. Digital ads like the one above are being targeted to residents in certain market segments and areas of low recycling participation. Use of 96-gallon-cart infrastructure in metropolitan areas and adjoining rural communities. Strong education and outreach programs for residents. A robust system of materials recovery facilities. Promoting those types of streamlined recycling steps actually ties into the campaign’s economic angle. The idea is that increased participation will improve route efficiencies and keep more plastic bottles out of landfills, saving public tax dollars used for disposal. The grassroots nature of the campaign and its broad endorsement is reflected in the array of over 40 supporters from throughout the value chain. This group includes state and local governments, MRFs, end users and a variety of trade associations, including the American Chemistry Council, APR, the Carolina Recycling Association, the Institute of Scrap Recycling Industries, NAPCOR, the Plastics Industry Association and the North Carolina and South Carolina chapters of SWANA. The full list of supporters can be seen at the “Your Bottle Means Jobs” website. Some of these partners will also play a key role in tracking the effectiveness of the initiative. MRFs in Raleigh operated by Sonoco and Waste Management have agreed to measure the amount of plastic bottle tonnage sold compared with the year prior to the campaign. As no major program changes are anticipated by the various local public recycling agencies, this year-over-year measure could be a reasonably accurate way to estimate the campaign’s impact. 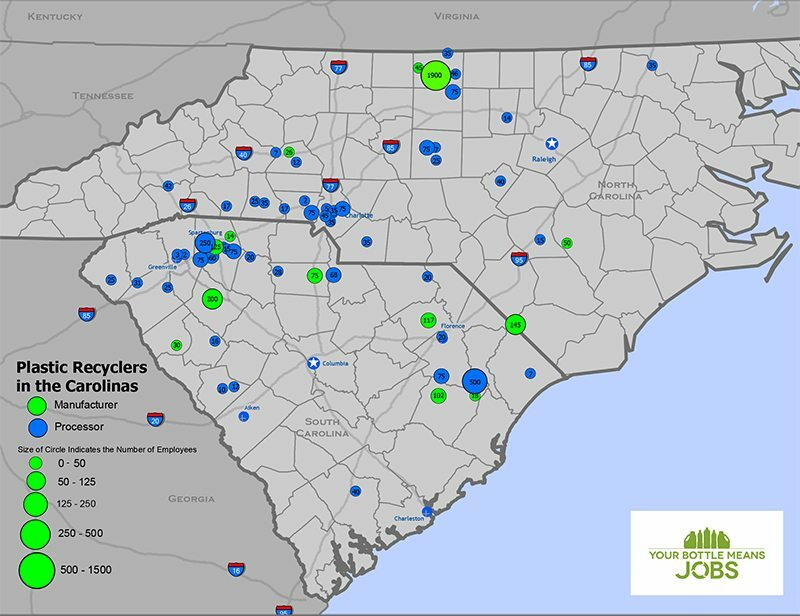 The effort to connect recycling to the health of the Carolinas’ manufacturing sector may strike a chord with local residents because of the history of product production in the region. In previous decades, the Carolinas were a hub for textile manufacturing. Greensboro, N.C. is home to the headquarters of Wrangler and was known for a time as the blue jean capital of the world. Haw River, a small town in central North Carolina, was the largest maker of corduroy fabric in the world in the 1960s and ‘70s. While much of area’s textile production has moved offshore, the use of recycled material represents something of a comeback. Greensboro-based Unifi is well-known for its use of recovered PET in its Repreve brand of fabric. Another compelling market player is Burlington, N.C.-based TS Designs, which makes a shirt from 50 percent organic cotton grown in the state and 50 percent polyester from PET. Keeping those types of companies well-supplied is an idea residents of all political persuasions can get behind. Ultimately, the focus of “Your Bottle Means Jobs” is to reach those consumers who have not responded to the recycling industry’s environmental messaging over the past 25 years but may respond to a message that connects their act of recycling with job creation. The Carolinas seem to be an ideal proving ground to determine just how transformative this approach can be. Blair Pollock is the solid waste planner at the Orange County, N.C. Solid Waste Department and can be contacted at [email protected]. Chantal Fryer is the director of recycling market development at the South Carolina Department of Commerce and can be contacted at [email protected].